I shared with you our termite travails yesterday. I was a little sloppy in my descriptions, I guess, because several readers thought it was Lila’s Brother who had gone termite surfing under our house. The confusion arose, because the termite exterminator’s first name, John, was the same as B-‘n’-Law John Perry’s. Some of you said you thought you knew John, but couldn’t identify him by his feet (which weren’t his anyway). Several other readers asked if John was in this class or that class. 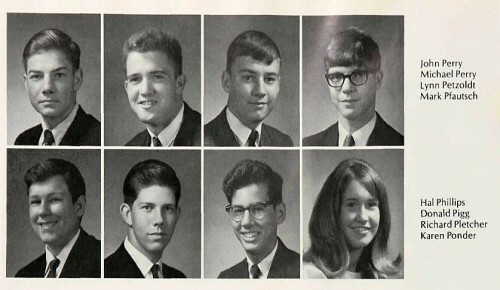 For the record, he was in the Central High School Class of 1970. 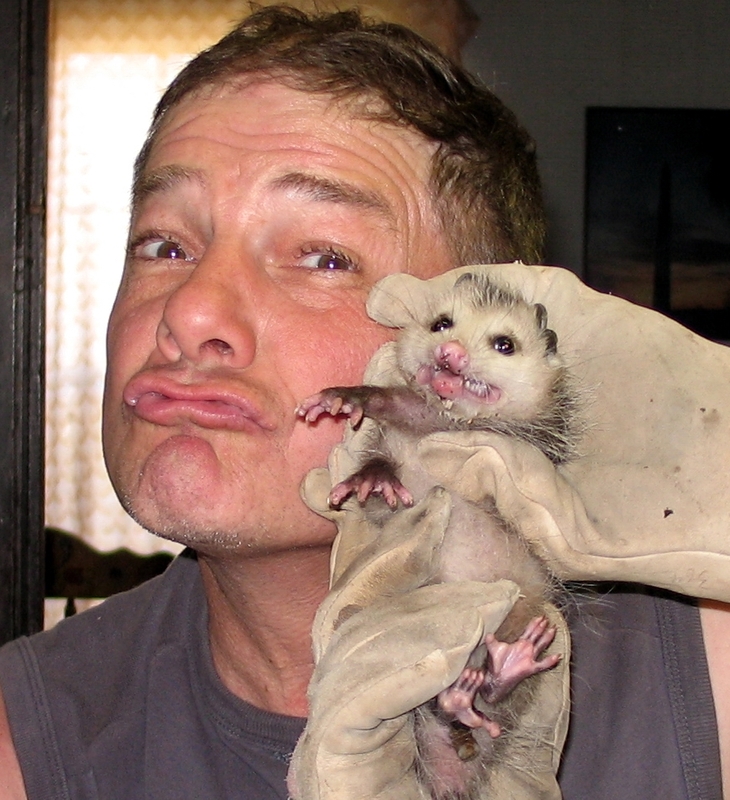 I posted a link to a photo of John when he was down here to repair our kitchen and discovered a family of possums. living under the sink. Again, my caption must have been sloppy, because there was some confusion then, too. For the record, John Perry is in the background. The possom, which was released unharmed, is in the foreground. I thought I was going to have plenty of time to wrap up the Barry Goldwater visit to Cairo photos, but things kept getting in the way. The termite guys came bright and early to do a second treatment. Then, John started putting the wall back together. The first step was to cut a heavy piece of treated plywood to go over and around stuff that had to stick through it. Is it good for flamingos to wear socks? Well, I’ve spent about half my life around construction and about half my life in Florida, so I know a little bit about building things and a little about flamingos. I didn’t, however, know if a sock-clad flamingo was a good or bad thing. From the photo, it appears to be a good thing. Wife Lila suggested, correctly, as always, that folks who went so school with him might recognize him as he was in those days. Here’s his junior class photo from the 1969 Girardot yearbook. Go shut off the water!!! After spending the afternoon visiting two hardware stores and an electrical supply dealer, John set to making more magic and I started editing Barry. Suddenly I heard John shout, “Go shut off the water!! !” I gathered that the flamingo was in the process of getting his socks wet. Look for the Barry Goldwater photos on Monday. Nasty little creatures. ToPo jeogoes that hiss with big teeth. My dog killed one and I tried to save the baby. Mean little creatures. I miss that old man, please send him home soon! Adam and I are holding on to his passport until he finishes what he’s started down here. You may have to come to Florida if you want to visit him. Brenda: They’re only “mean” to folks or critters who mess with them. Most animals don’t go looking for trouble. (I’m learning to handle an opossum at our local zoo. And yeah, I wear a heavy glove when doing so, just in case…). 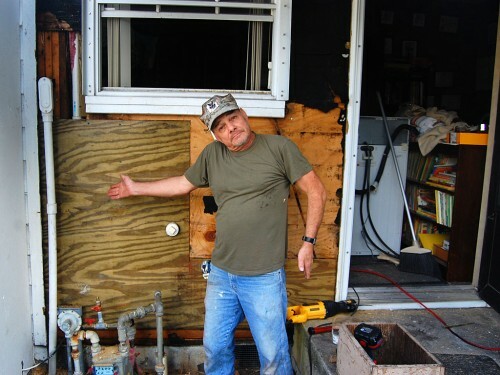 Always entertaining when you have some sort of construction done on your house. PLEASE let John stay longer so I can see more “projects” that have twist and turns in them. This is better than driving by an accident slowly. Now I have heard it all, my husband usually says “socks on a chicken”, but since he is in Florida I guess he needed a tropical bird to use. And Ken don’t ever ask him what he got for Christmas or his birthday, you won’t like his answer, it usually starts out like: I got a pair of socks and a piece…….I’ll let him finish it for ya! Tell him I said HI, and he can stay a little longer if he wants too…ha ha!